The combination of bright malt, noble hops, and Bavarian-style lagering produces a clear, golden beer. Let it shine, let it shine, let it shine! This big Double India Pale Ale is continuously hopped with mosaic, leading to the huge hoppy highs that compliment the compelex malty depths and higher ABV. 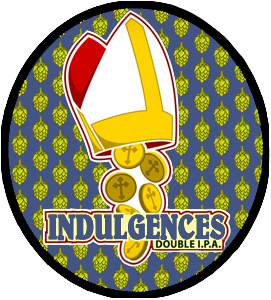 95 IBUs of mosaic hop goodness cut through the malt and alcohol of our DIPA like Martin Luther’s “95 Theses” cut through the corrupt medieval practice of selling “indulgences.” His reformations spread far, sparking events which would impact everything from church hierarchy to basic freedom of thought. Indulge your reformation spirit with our tongue-in-cheek nod to this controversy. This spontaneously fermented Sour Ale matches a Weizenbock base with Balaton cherries from a family orchard in Michigan. The result is a complex and refreshing dry ale with a tangy finish....truly ex nihilo. A subtle blueberry flavor gives this Saison a crisp tartness that balances well with peppery and citrus notes produced by the yeast. Blueberries from a family farm in Kissimmee are warm conditioned for several weeks. Worth the wait.